WHY DID THE PILOTS END UP IN MILWAUKEE? Beginning with the Milwaukee Braves move to Atlanta, a group led by Bud Selig and Ed Fitzgerald had worked hard to bring another team to Wisconsin. In early September 1969, they got their chance. "The day I called Dewey Soriano was the day I had read in the paper that the then-mayor of Seattle was threatening to evict the Pilots," said Selig. Mayor Floyd Miller's threat resulted from the team's refusal to put up a bond guaranteeing the rent on Sick's Stadium. While the wisdom of that threat can be debated, the Pilots actually had refused to pay their rent in June, William Daley had threatened to move the team and less than a week earlier, a national news report had the Pilots moving to Dallas. Other Seattle officials threatened to sue if the team left. Selig flew to Seattle soon after his phone call with Soriano and after roughly a month of secret negotiations, a deal was struck during game one of the 1969 World Series. The Pilots' owners would sell the team to Selig for $10.8 million and he would then move it to Milwaukee. "Lamar Hunt and a Texas group also wanted to buy the team, said Pilots co-owner Max Soriano, "But we had felt we had made the gentlemen's agreement with Bud Selig and the Milwaukee group that's what we were committed to." 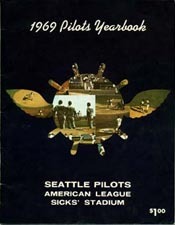 The Pilots' only team yearbook. The American League knew about this deal, but publicly vowed that the Pilots would stay in Seattle. The league had little to lose; if a Seattle buyer stepped forward, the A.L. would be rid of the Pilots' current ownership while dodging a lawsuit. If no one surfaced, they could move the team to Milwaukee with a clear conscience. As the months dragged on, it became obvious that no one in Seattle was interested in buying the Pilots under the terms set out. With the season fast approaching, the Pilots' move to Milwaukee was set for a vote at an American League meeting in Tampa Bay on March 17, 1970. When the state of Washington got a temporary injunction to prevent a shift, Pacific Northwest Sports, Inc. (the Pilots' parent company) filed for bankruptcy. The reasoning was that the court could order the sale, letting team and league officials off the hook from any lawsuits. Spring training for the 1970 season was just wrapping up when truck drivers were told to take all of the Pilots' equipment to Las Vegas and wait for a phone call. On April 1, 1970, Judge Sidney Volinn ruled that the Pilots were, indeed, bankrupt and ordered them sold to Selig's group. "I can still remember Orlo Kellogg, attorney for the Bank of California," said Volinn. "His argument was very brief. I think the sale price was $10 million and Orlo, in his final argument--wringing his hands--said, '$10 million judge, think of it. Ten million dollars would pay everybody, including my client...and what do they have to offer? Only hopes.' "
The drivers got their phone call, ordering them to go to Milwaukee, where the team was renamed the Brewers. It happened so quickly that there weren't even new uniforms available. As the Pilots name and logo were removed, the name "Brewers" was stiched on in their place. The Sorianos were burned in effigy, but the other baseball owners thought themselves rid of the Pilots fiasco. They were wrong.